Oil Rocks—otherwise known as Neft Daşları—is one of the first and largest offshore oil-platforms ever built. 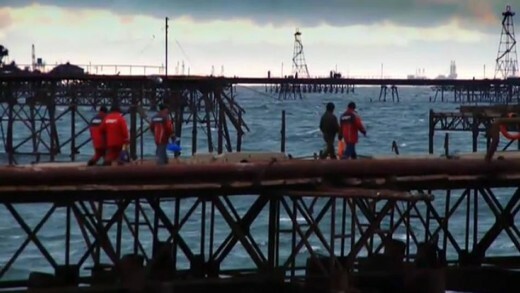 The location is a vast industrial city in the middle of the Caspian Sea, ordered by the Stalin regime in 1949. 60 years on, Oil Rocks is still operational and the first western film crew in its history receives access. The result is this film which documents 200 kilometers of bridges, thousands of oil workers, hundreds of platforms, up to nine-story buildings, a park and a sports field—nothing less then an oil-rig ‘Atlantis.’ By combining archive footage from the Soviet era and interviews with workers, this film tells the story of the oil fields and the extremely hard work by those involved to this day.